In October this year, Danmore Chuma, a community volunteer and Edgars Club member, approached Edgars Club on behalf of a child in Chiweshe with a medical appeal. 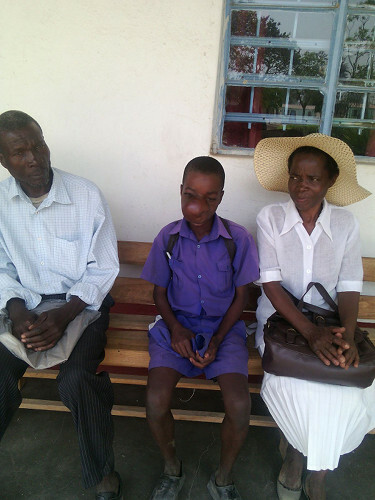 Motion Mutumwa, a grade 6 pupil at Bare Primary School, needed to undergo surgery for a hard tumour swollen in his nose. The problem developed about four years ago, but Motion had not received medical assistance as his parents were unable to raise the necessary funds for the operation. Seeing Edgars' role in Corporate Social Responsibility, and being a beneficiary of the Edgars Hospital Cash Plan on his wife's account alongside their four children, Danmore believed Edgars might be able to assist. "We really have been so desperate until Danmore Chuma came to our rescue and helped share with us the challenge that we have been facing since 2011, as both the school and his family. Currently, Motion is in Grade Six and is awaiting to write his Grade Seven Examination next year in October- only ten months left. Our school records show that Motion is an above average pupil who has, of late, been affected by this ailment, and his performance has since been affected negatively. Through this kind gesture, we have every hope that this is going to take him a long way in recovering. May The Lord God, The Almighty Father, bless the hand that giveth." It is truly an honour to be able to touch the lives of those in the community around us. We wish Motion a speedy recovery, and all the best in his exams to come. © 2019 Edgars(Pvt) Ltd. All Rights Reserved.